Try mentioning the social media website Tsu.co on Facebook or Instagram -- or even in a private conversation on Facebook Messenger. It won't work. 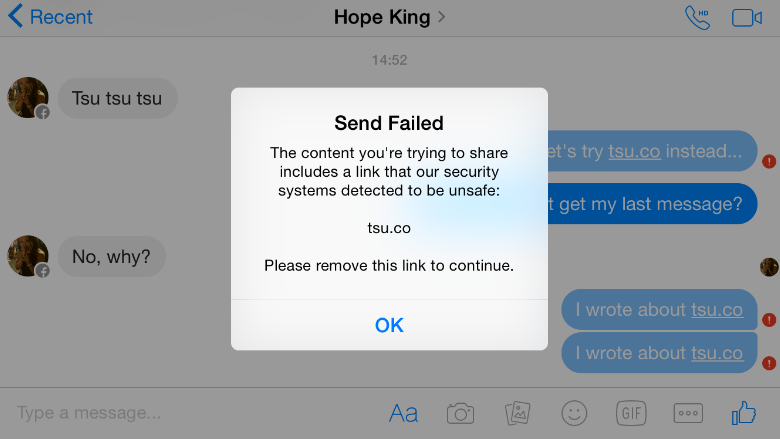 Facebook (FB) is blocking any link to Tsu.co on every platform it owns, including Messenger and Instagram. 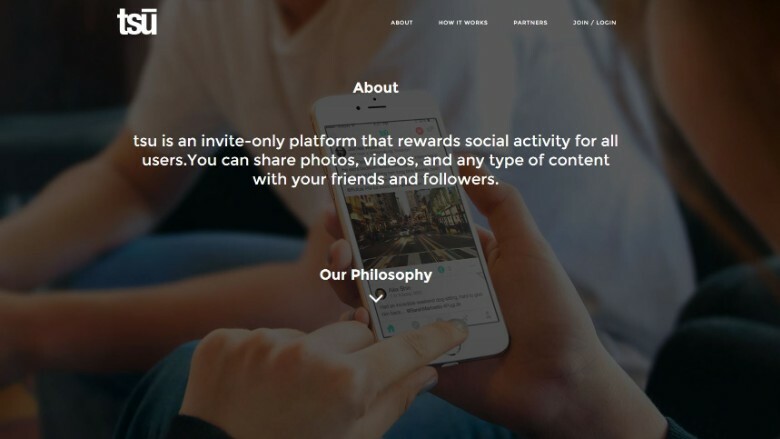 It even went back and deleted more than 1 million Facebook posts that ever mentioned Tsu.co, making pictures, videos and comments disappear in an instant. You can type the name "Tsu," but you'll be blocked if you write "Tsu.co" or post any link from the site. "We're persona non grata," said Sebastian Sobczak, who founded Tsu. "You can type in all sorts of seedy websites, and you can get to them. But not us. We don't exist." This time, it's blocked on Facebook Messenger. Note how none of the messages goes through. That means there's a financial incentive to post on Tsu, invite people to Tsu, and direct people to your Tsu page. There's even incentive to send people to the Tsu pages of the folks who you brought into the Tsu network. And that's exactly what Facebook has encountered. Tsu users were creating fake accounts to boost their pages. Facebook says its users started reporting Tsu.co links as spam, which Facebook defines as "sending bulk messages, excessively posting links ... and sending friend requests to people you don't know personally." Tsu said it had been receiving a decent amount of traffic from Facebook, averaging more than 2,534 visits a day. When that dropped to zero, Tsu appealed to Facebook, arguing that it didn't violate Facebook's terms of service, because it did not pay users to push content to Facebook. 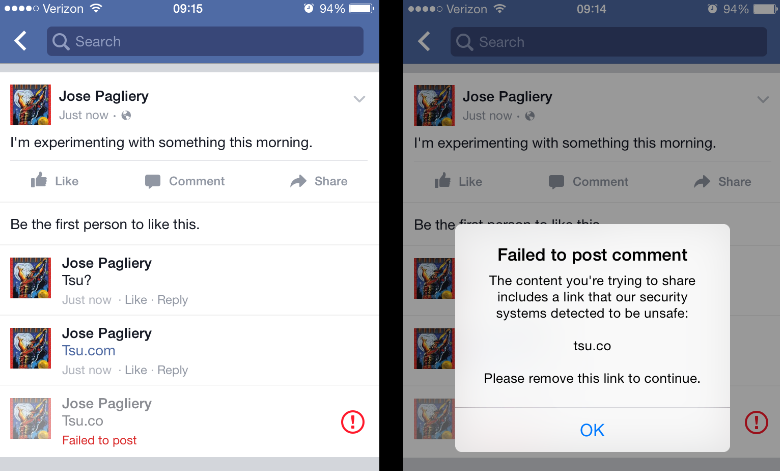 Facebook says it will unblock Tsu if it changes just one thing: Tsu users shouldn't be able to simultaneously post to Tsu and Facebook. "We do not allow developers to incentivize content sharing on our platform because it encourages spammy sharing," said Melanie Ensign, a Facebook spokesperson. CNNMoney spoke to a dozen Tsu users. Most are photographers, models and other artists drawn to what they say is Tsu's more equitable pay-for-content program. Most of them haven't made a dime yet. But they feel this Facebook block is unfair. Here's what happens when you post any mention of Tsu.co publicly on Facebook. Claudia Everest is a 47-year-old cancer survivor living in northern England. To pass the time during chemotherapy, she started A Dog A Day, drawing 25 dogs every day and selling her work from home. She's furious that Facebook deleted every post in which she ever mentioned Tsu.co -- 7,500 by her estimate. "Facebook either completely removed or labeled them as malicious content," she said. "If you take a look at my cartoons I think you will agree that the idea that my work is malicious is laughable." Carolina Franco, a 28-year-old model in Colombia, thinks Facebook's strategy is an attempt to keep its users from flocking to a competitor. "Very few people even know about Tsu," she said. "I don't believe that Facebook and Instagram want Tsu to go viral. it would cost them a lot of money."